Here we feature the story of Chuck G. from Arizona, a self-described “Savage Maniac”. 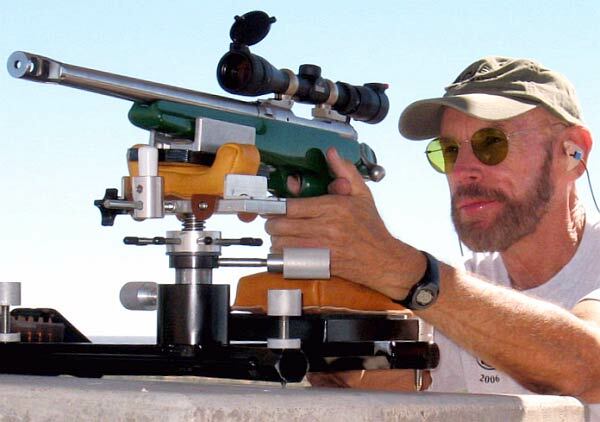 Over the past two years, Chuck has taught himself the fine points of Savage tuning. Our featured firearm is a Savage Striker single-shot pistol that Chuck has transformed from a ho-hum .308 into a reliable half-MOA precision 6BR that can run with accurized rifles all the way out to 1000 yards. 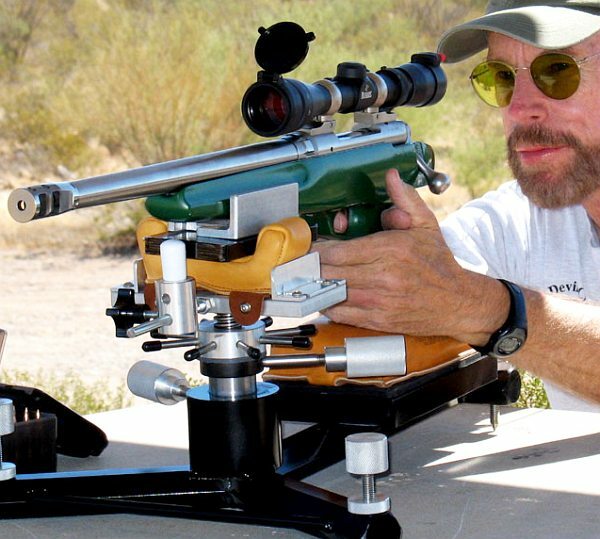 In addition to his Striker, Chuck reviews his collection of four other customized Savage rifles. Chuck tells us: “Now retired, I turned 70 in November and have been living in Tucson for the last two years. I started shooting as a kid in Southern California and have enjoyed shooting off and on throughout my life, mostly plinking, hunting and casual target shooting. I was looking for an activity when I moved to Tucson in early 2005. I bought some Glocks, an AR15, and a competition shotgun, all the go-fast gear, and started shooting in weekly pistol and 3-Gun matches. It was lots of fun but I found I was too old and slow to win at these rapid-fire games. I decided to rebuild the Striker in a caliber that would be more fun to shoot. 6mmBR was an obvious choice for all the usual reasons–good brass, wide choice of match bullets, easy to load, low recoil, very accurate, and relatively cheap to shoot. As part of a group buy through the SavageShooters.com Forum, I ordered a 15″, SS match grade, 3-groove, heavy varmint contour, 10-twist barrel from Pac-Nor. To set the freebore, I provided Pac-Nor with a dummy case with an 88gr LD Berger bullet seated to use as a guide. Total delivered price was $340 chambered and threaded for a muzzle brake. (I planned to add a $100 brake from JP Rifles). At this point, still waiting for the barrel, I decided to address the trigger problem. 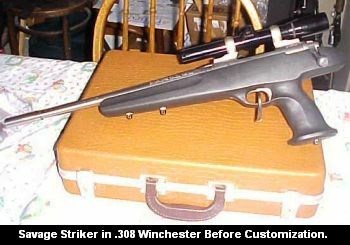 I had hoped to fit an aftermarket trigger, maybe a Rifle Basix, but I discovered that was not an option for Strikers. To use a Rifle Basix trigger, I would have had to change the configuration to a rear grip and have a stock made. That would be too expensive for this project. When I got the Striker back the trigger was light all right. So light that when I closed the bolt it would slam fire, the safety no longer worked and when I tightened down the rear action screw, the sear would not hold at all on the trigger bar. Not good! So, I attacked the trigger myself again and after many hours finally got it adjusted down to slightly over a pound and crisp. In doing this I learned a lot more about Savage triggers than I ever wanted to know, but now it works. Once the pistol upgrades were completed, I headed to the range to break in the barrel with some 80gr Bergers I had loaded up over H4895. After 25 rounds of the break-in process, I shot a 5-shot, 200-yard group that measured 1.246″. Not too bad, I thought, for a break-in load with new brass. I knew I was going to like this rig. 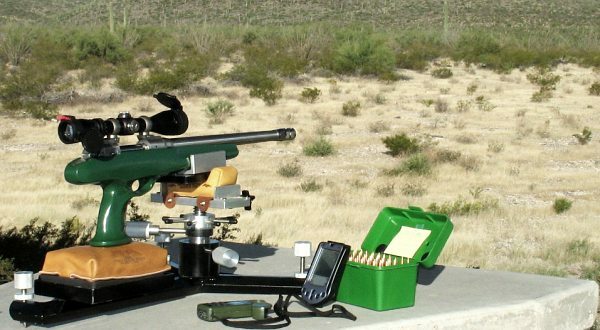 Later trips to the 200-yard range with different loads regularly produced sub-MOA groups. I decided to move it out to 600 and thought perhaps Berger 95gr VLDs over Varget would work pretty well in the 1:10″ twist. (I usually shoot 105 JLKs in my 8-twist 6BR rifle.) You may be surprised, but the 95s seem to stabilize fine in my 10-twist Pac-Nor. The next step for my Striker was to try it out on silhouettes at 200, 300, 400 and 500 meters. I loaded up some of the Berger 95s to see if they had enough “oomph” to knock down the rams at 500m. As you can see from the video below, the 95s did the job. 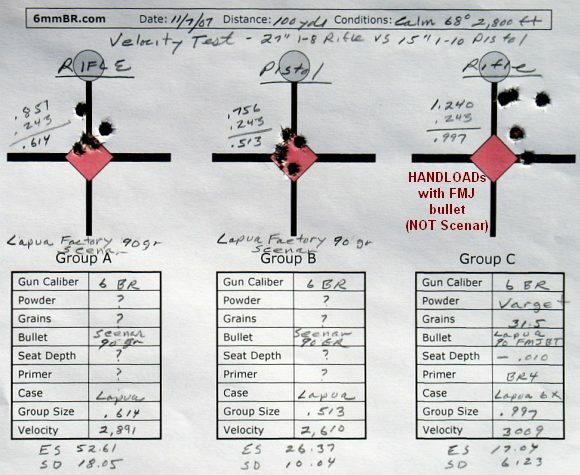 With further load development and bench practice, the gun is showing even more accuracy potential. 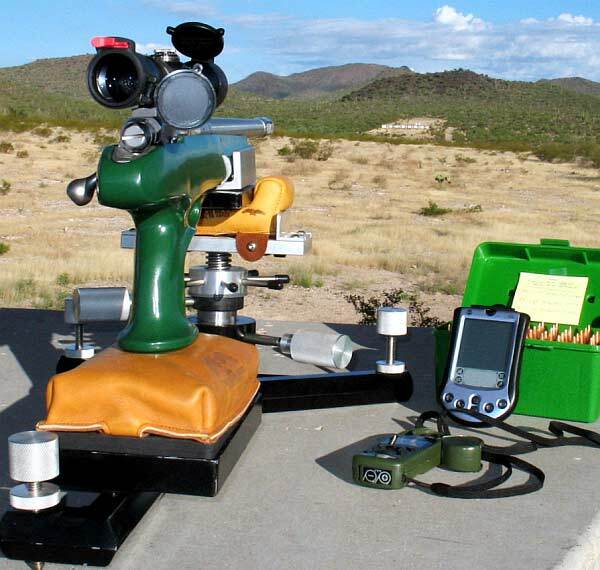 (See “Benchrest Solutions” section below). 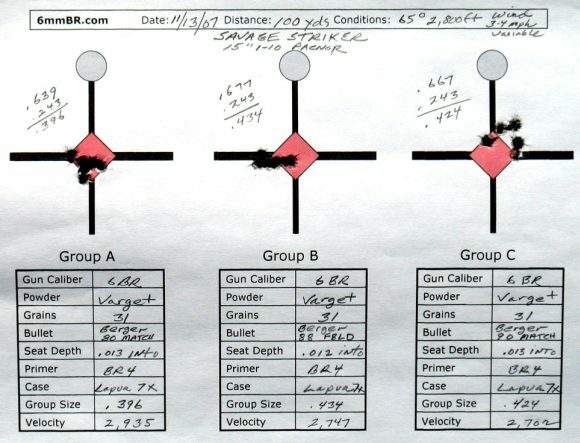 Using a 24X target scope, the Striker has delivered 5-shot groups in the 3s and 4s during recent range visits. All in all, I’m very satisfied with the project. I ended up with an accurate, fun-to-shoot gun for under $1,000 including scope, paint, and bedding materials. I had little prior experience with this kind of work but now have no reservations about attacking any Savage accurizing project that does not require a lathe. The nice thing about Savages is that you can change the barrel yourself with few tools in less than half an hour. Pre-threaded and chambered aftermarket barrels are excellent and reasonable in price. These “pre-fit” barrels can save you both time and money. To test loads for this article, I swapped the Burris pistol scope out for an older Sightron SII 24X in Burris Signature Zee Rings and installed an Evolution Arms Picatinny rail mount. After analyzing my targets, I noticed that most of the spread was vertical. When your Editor viewed videos of me shooting the Striker he noticed that the muzzle was hopping pretty radically. He suggested that the vertical spreads might shrink if I could tame the Striker’s muzzle hop. Compare that to this previous target, shot during ladder testing with NO bungee system in place. The difference is quite noticeable. Even without the 24X scope and the bungee tie-down the pistol was able to easily knock down silhouettes at 200, 300 400 and 500 meters with 95gr Bergers as we show on the video clip. 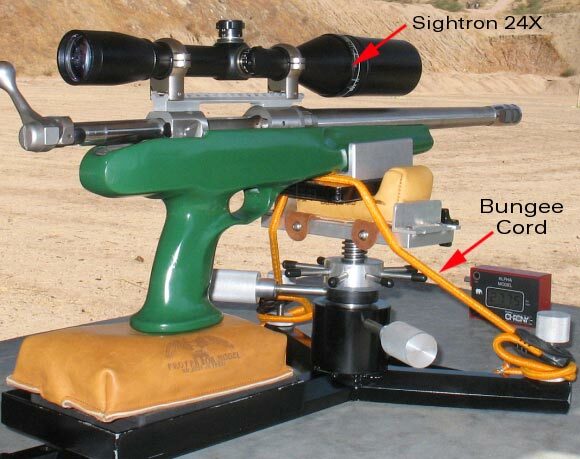 With the 24X scope and bungee system the pistol produced 5-shot, 100-yard groups in the 3s and 4s with Berger 80-90 gr bullets, 200-yard groups in the 8s with Berger 95 VLDs and Sierra 95 SMKs. On December 4, I revisited the 1000-yard range. 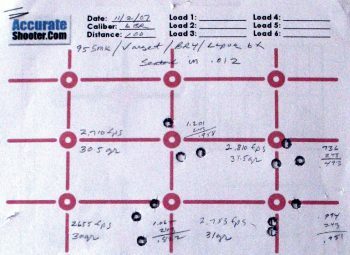 Using the 24X scope and bungee tie-down, the Stiker produced a 5-shot group of 8.4″ at 1000 yards — about the same as my very accurate 300 WSM rifle shot a half hour previously. I’m becoming more and more convinced that, in some respects, a long-range pistol is easier to shoot off a good rest than a rifle. I think that by not touching the weapon with your head or body there are fewer ways to screw up the shot. Now that testing is complete, I’m going to re-install the Burris scope, put the barreled action in another stock and shoot it for a while off a bipod at silhouettes. This summer I’ll widen the benchrest stock in the forearm to 3 inches with Bondo and add some lead tape for more weight. I was interested in seeing how much velocity the 15″ Striker gives up compared to a 6BR rifle with a long barrel. Since I also own a Savage rifle chambered in 6BR with a 27″ barrel, I decided to do a direct comparison. Lapua, through Adam Braverman, was kind enough to provide some excellent 90gr factory-loaded 6mmBR Lapua ammunition for our comparison test. This ammo is rated at 2950 fps from a 26″ rifle barrel. Reloading seemed very complicated to me at first. I had never loaded a round in my life when I started last year and learned what I know now mostly by trial… and sometimes by error. I’ve made some errors and learned from the experience. I forgot to put powder in one case in an early batch and the primer stuck the .308 bullet so tightly in the barrel I had to take it to a gunsmith to get it removed. Another time I heard a phfffft in a match instead of a bang and found I’d seated a primer upside down. If I’ve learned nothing else, it is to ALWAYS take my time and be CAREFUL. And always inspect your ammo BEFORE you take it to the range. I try to keep things as simple as possible and stick to one basic load for each rifle/specialty pistol. The loading procedure I follow is the same for all calibers. When starting a new batch of brass I uniform the primer pockets, size and chamfer the necks and, except for the 6.5 brass that has to be neck turned, just load and shoot a normal load to fire-form the cases. Before priming new cases I inspect them for defects, sort them by weight and put them into the loading block in a sequence according to weight. I keep the cases in this same sequence grouping during future reloads so I only have to weigh them once. I’ll put aside for foulers any cases that are more than ± 2.0% of the average weight of the batch. When reloading a batch I clean the necks of the fired cases as I remove them from the box with fine steel wool, arrange them in the same order in a block and lube them with a spray of One Shot. I deprime them and size the neck with a Redding Bushing Die, using a bushing that will give me about .002″ neck tension. If necessary I bump the neck with a Redding die. I then trim all the cases to the length of the shortest (within reason), and, using the RCBS Trim Mate Prep Center, deburr and chamfer the necks and brush out the primer pockets. At this point I use a Lee Hand Priming tool to set primers and my Lyman 1200 DPSII electronic powder dispenser and scale to charge the cases. Using this device each charge is weighed to ± 0.10 grains. Occasionally I check a charge with a balance scale to verify the weight. 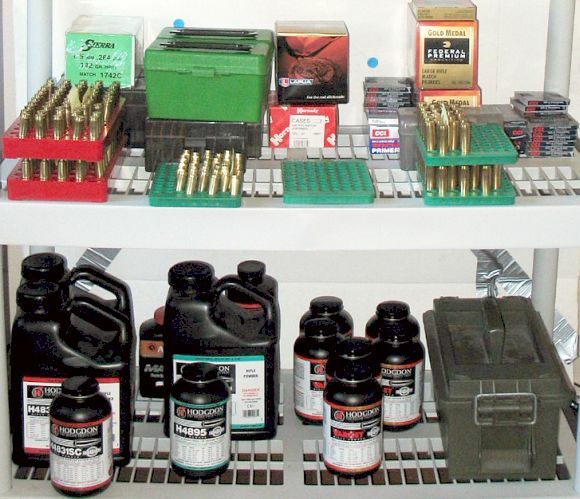 I get the best results and save time overall by using the best quality bullets I can find. Originally I weighed and sorted all the bullets I loaded. I spent a lot of time doing this. However, I found with Berger, JLK and even recent batches of Sierra 142 SMKs, there is very little variation. I rarely sort bullets anymore. I mostly just load ’em and shoot ’em. I am very careful about seating depth. Before loading each batch I measure the seating depth to the lands with a Stoney Point OAL gauge and several bullets from the batch I’m going to load. Using the average of these measurements I seat to bullets to the depth I found best for that round. This is usually about .015″ into the lands with Berger VLDs, JLK VLDs, and Sierra 6.5 142 SMKs. I seat about .010″ off with Sierra .30-caliber 168s or 175s. Since purchasing my first Savage bolt action in early 2006 I’ve been hooked on these rifles. I’ve become a Savage-oholic. I’m powerless when I see a Savage for sale. I just gotta buy it! I’ve come to believe that Savage bolt guns are perfect for a guy with little experience who wants to get into long-range shooting and precision reloading. They are so easy to work on and there are so many good aftermarket parts available that they can be configured into whatever platform a new shooter wants…without mortgaging the house. In spite of having no gunsmithing experience and little mechanical aptitude I’ve found that with a few tools even I can change barrels, install triggers, mount scopes and skim-bed and finish stocks. It ain’t rocket science. One does not have to spend a fortune and wait for months to get a rifle upgraded into a good shooter. If I can do it…anyone can. Having accurate rifles encourages a guy, I think, to learn how to load properly to maximize results. I’d never loaded a round in my life 18 months ago but am now quite happy with the accuracy, ES and SD of the rounds I’m turning out in my spare bedroom. All the information necessary to learn how to do this stuff is readily available on internet discussion forums like AccurateShooter.com, Benchrest Central Forum, Savage Shooters Forum and others. And the participants in these forums are always ready to help a new guy. Here is my “Tribe” of Savage/Stevens rifles with brief descriptions of their components, the upgrades I’ve done, and comments on how they shoot. I had been wanting to try a 6.5, so early this summer I purchased a Savage 6.5-284 from the Benchrest Central classifieds. This is a very nice Model 12 single-shot with a 28″ Pac-Nor SS Super Match 8-twist, 3-groove barrel, and a Rifle Basix Sav-2 trigger. The barreled action sits in a beautiful, dark red Stockade LRBR stock to which weight was added. As purchased, it weighed 17 lbs with a 24X Sightron on a Farrell mount. This gun (I call it “Big Red”) tracks the bags very nicely. It’s just about perfect just the way I bought it. This is a keeper. I’ve made only a couple of changes to this rifle. I moved the Sightron to the 300 WSM and replaced it with a Leupold 8.5-25×50 LTR with Burris Xtreme tactical rings. I put Kenton BDC knobs on this scope and I added an adjustable recoil pad as the stock was about 1.5″ too short for me. After the additions, the rifle now weighs a hefty 18.8 lbs and I’m using it only in 1000-yard Heavy Gun class. It likes a fairly standard 6.5 match load of 142 SMKs over 51.6gr of H4831sc, Fed 210M primers, and Lapua brass. The 2,850 fps this load provides seems gets the job done and hopefully won’t burn up my barrel too quickly. This rifle is the first one I’ve owned with a tight neck. The neck is.290 and I have to take off quite a bit of brass from the Lapua cases to make them fit. I’m not really sure how much the tight neck helps and I’m finding it hard to keep the turned necks uniform. A new Shilen barrel I have on order will have a .297″ no-turn neck. I replaced the Savage barrel with a Pac-Nor 28″, 10-twist, 3-groove, stainless Super Match. I then installed a JP Rifles recoil eliminator. I also installed a Rifle Basix Sav-2, 4 oz. trigger and added a Sightron 24X scope in Burris Signature rings. I have Kenton Industries BDC knobs on this scope. These calibrated knobs allow me to easily dial any distance I want to shoot. The last step was replacing the BVSS stock with a rosewood/brown laminate Long Range Benchrest stock from Sharpshooters Supply. This stock came 100% inletted (a true drop-in) and pillar-bedded. I then finished it myself with Tru Oil. This was my first attempt at stock finishing and I was happy with the result. The 300 WSM serves as my 1000-yard Light Gun. The Pac-Nor barrel has a no-turn neck. (I provided a dummy round with a 210 Berger to set the throat). I’ve settled on 210 VLDs, either Berger or JLK, over 62.5gr of H4831sc and Federal 210M primers in Norma brass as my long range load in this rifle and get about 2,700 fps. Learning to do the simple work myself and selling the parts I took off the rifle helped keep the cost down on this upgrade. My first Savage was a “plain-Jane” Model 10 in .308 Winchester. It shot sub-MOA, but I wanted something better so I decided to build a more accurate .308 this spring. 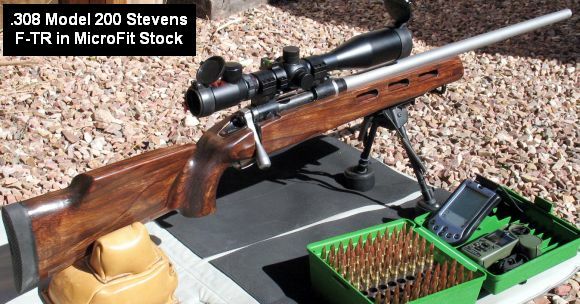 On the web, I found a used Stevens 200 rifle with action accurized by Fred Moreo (Sharpshooters Supply). It had an SSS trigger and a Farrell scope mount, but the gun’s aftermarket hunting-type stock and 7mm-08 barrel didn’t interest me. As the price was right I bought it for the action alone and then resold the stock and barrel immediately, recovering most of my purchase price for the whole rifle. I ordered a 28″, 1:10″-twist SS match grade barrel from Montana Rifleman and had them install the muzzle brake from my first 300 WSM. The brake is easily removable so I can still use the rifle for prone matches. The final inletting and pillar bedding was more than I wanted to tackle so I had this done by a local gunsmith. That was very expensive, but he did good work. Finishing the stock was a real job! I ground and sanded for days trying to get it smooth but never did get it perfect. Due to the height of the comb it was necessary to channel the comb so the bolt could be taken out. At least the stock is comfortable to shoot from prone. Usually I shoot this rifle with a Harris Bipod fitted with Pod Paws for additional stability. The barrel was chambered with a no-turn neck and I use two different loads. Out to 600 yards, I feed it 168 SMKs over 41gr of H4895 and Fed 210M primers in Lapua cases. This has been a good accuracy load in both my .308s. For 1000 yards, I load 175 SMKs driven by 44gr Varget and CCI BR2 primers in Lapua cases. 2,660 fps is about as much as I can get with the 175gr load but it stays nicely supersonic at distance. This gun works quite well for its intended application. I’ll admist .308 Win is not my favorite caliber for long range but a guy has to have at least one .308 in the safe. I ordered this rifle in July of 2006 from an out of state gunsmith before I had learned to do much work myself. By the time it arrived, 10 months later, I had become so exasperated with gunsmiths that I taught myself how to do most of the work on my Savages. 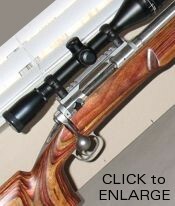 I ordered a blued Savage Model 12 single-shot with a chrome moly target barrel chambered for 6BR, no-turn neck. I asked the gunsmith to install an SharpShooter Supply (SSS) match trigger and a Ken Farrell mount and even told him where he could get the action inexpensively. I provided a drop-in, finished SSS Long Range BR fiberglass stock and asked him to simply bed the action. I paid in full in advance. The smith said it would take a couple of months. After countless delays, unanswered calls, emails, and excuses, the rifle finally did arrive. I was amazed to find first that he had finished a stainless action and the barrel in tactical black paint. It looked OK but a painted action was not what I wanted. No scope mount was installed, the factory trigger was still in it, and the barrel and tang were rubbing on the stock in several places. I was not a happy shooter but after 10 months I wasn’t about to send it back. To the smith’s credit he did apologize and refund what I had paid for the parts he did not install. I finished fitting the stock myself, and installed a Farrell mount and a Rifle Basix SAV-2 trigger. 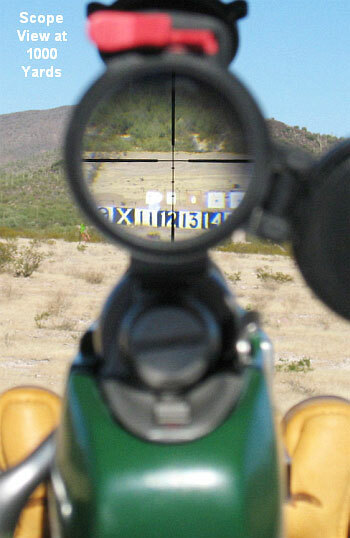 Then I added a Sightron 24×42 target scope with Kenton knobs. 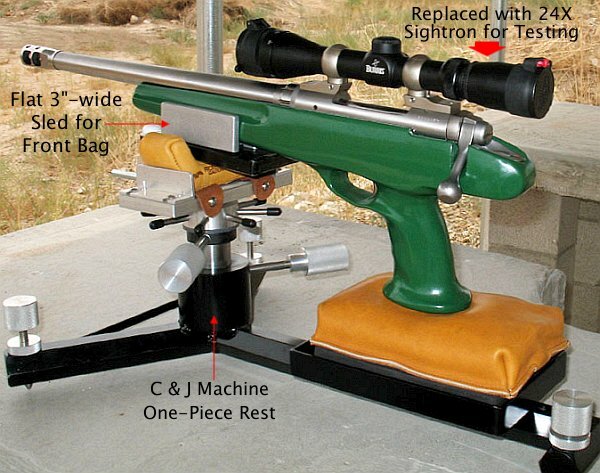 My idea was to use this as a dual-purpose rig that I could shoot either from the bench or prone from a rest. I could not get a good cheek weld when prone with the LRBR stock so I installed a Karsten’s Adjustable cheekpiece. This works well — I can lower it when I’m shooting from the bench or cleaning the rifle and raise it when I hit the ground. Although I’ve tried a number of loads in this gun I’ve settled lately on JLK 105 VLDs (the original Jimmy Knox bullets) over 30gr Varget and BR4 primers in Lapua cases. I’m getting about 2,900 fps from this load. 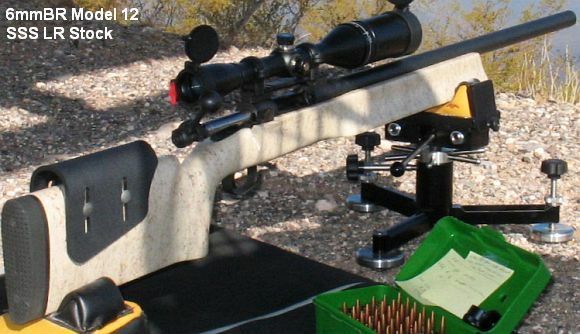 With low recoil, and great inherent accuracy, it’s a fun rifle to shoot. Favorite Among the Four Rifles? I purposely configured these four rifles to be very similar in size and feel. 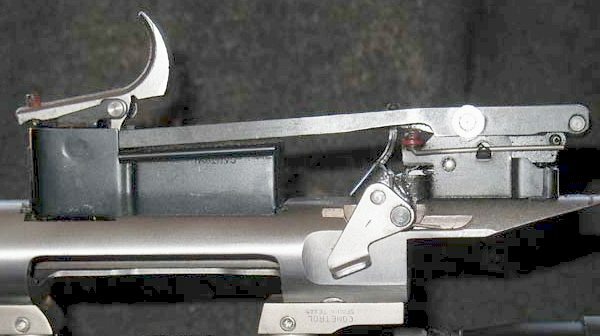 The bench guns all have similar Tooley MBR-style stocks and Rifle Basix Sav-2 triggers. Two have Sightron 24-power scopes. This makes it easier to switch rifles when moving from Light Gun to Heavy Gun relays. Which do I like best? Heck, I always like the one that just shot the best group! As each of the rifles has a slightly different purpose, it’s hard to compare one to another. They all do their job. Collectively, the four rifles handle all the target shooting I want to do. Although not as fancy as the high-priced bench guns I see at matches, my “tribe of Savages” has been perfect for a neophyte like myself who is still learning to shoot long range and load precision ammo. 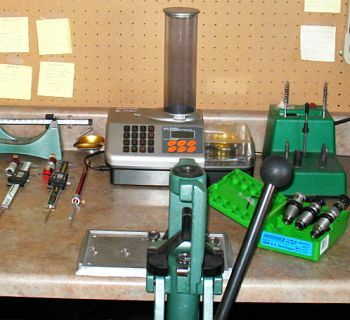 Topics: 6mm, 6mm BR, 6BR, Norma, .308 Winchester, .243 AI, Savage, Accutrigger, Dave Kiff, PT&G, Pacific Tool, Pac-Nor, PacNOR, Prefit, Richard’s Microfit, Redding, Forster Ultra, Wilson, Micrometer, K&M, Arbor Press, 105, varmint, silhouette, 600 yards, F-Class, Benchrest, BR, Bench Rest, Single-shot, competition, rifle accuracy, Norma, 203B, Hodgdon Powder, H4895, IMR, IMR 4895, Varget, Vihtavuori, Berger Bullets, Sierra, Clinch River, Lapua Scenar, Sierra, MatchKing, Competition Shooting, stocks, SuperMatch, Shooting Chrony, Beta Master, Oehler, stainless barrel, reloading, powder, case forming, neck-turning, Lapua Brass, Scenar, bullets, precision. All content Copyright © 2017, 6mmBR.com | AccurateShooter.com, All Rights Reserved.